Since Donald Trump’s surprise election victory in November, the 45th President of the United States has been on a collision course with the Federal Reserve. During his tumultuous campaign, Trump repeatedly attacked the US central bank, suggesting he would remove the current chair Janet Yellen from her position and nominate a more appropriate successor by the summer. Despite these threats, Yellen has remained above party politics, insisting she will complete her full four-year term at the head of the US financial system. In Yellen, it seems, Trump faces a formidable opponent. Yellen’s appointment as Chair of the Federal Reserve in February 2014 marked a historic moment in the financial world. After rising to the top of a heavily male-dominated field, Yellen is the first woman to lead the US central bank in its 100-year history. The same year as her appointment, Yellen was named the second most powerful woman in the world by Forbes, coming in just behind German Chancellor Angela Merkel. As the gatekeeper to the world’s largest economy, Yellen holds one of the most influential positions in global finance. But as she has proven thus far in her tenure, her great power is equally matched by prudence, diligence and steady resolve. “Although we work through financial markets, our goal is to help Main Street, not Wall Street”, Yellen told Chicago audiences in her first official appearance as Chair of the Federal Reserve. Born in the Bay Ridge neighbourhood of Brooklyn in 1946, from a young age Yellen was made acutely aware of the impact of economic hardship on ordinary citizens. 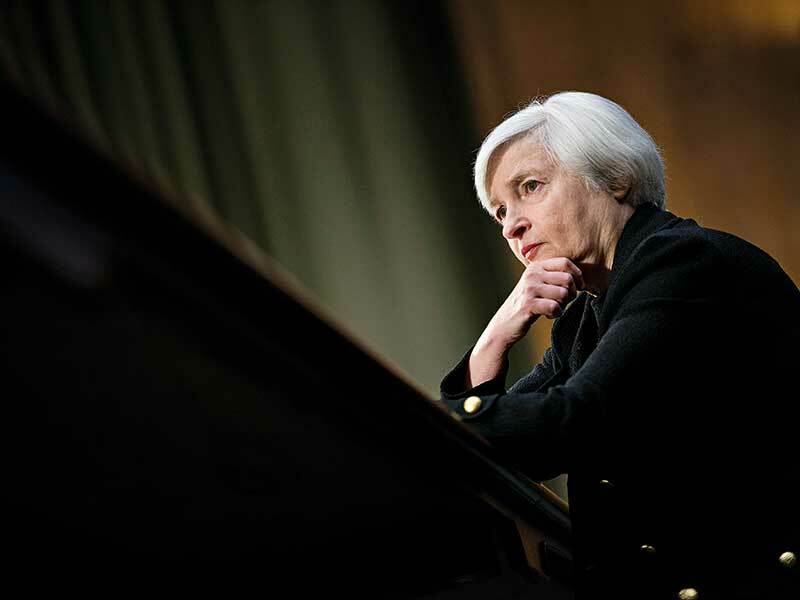 Speaking to The New Yorker shortly after her appointment, Yellen said: “My parents were born in 1906 and 1907. I think the experience of the Depression greatly influenced the way they thought about the world.” Her father, the son of Jewish immigrants from the Polish town of Suwalki, was a family doctor who frequently carried out house calls, while her mother was an elementary school teacher. After graduating as valedictorian from Fort Hamilton High School, Yellen launched her academic career at Brown University, where she majored in economics. She continued to pursue the subject at PhD level, moving to Yale to study under Nobel Laureate James Tobin, a leading Keynesian economist whom Yellen later described as her intellectual hero. Of the two dozen doctoral students who earned their economics PhDs from Yale in 1971, Yellen was the only woman. Upon receiving her PhD, Yellen took up an assistant professor position in the Harvard economics department. When, after six years at the prestigious university, she did not make tenure, Yellen turned her attention to the Federal Reserve System, beginning to work as an economist with the Board of Governors in Washington. There, she met her future husband, fellow economist George Akerlof, and the pair were married within the year. In Akerlof, Yellen found not only a life partner but also an intellectual equal, with whom she shared similar views on the social impact of economic policy. The couple have collaborated professionally throughout their marriage, promoting the integration of social justice and public policy into financial theories. After additional teaching spells at the London School of Economics and the Haas School of Business at the University of California, Berkeley, in 1994 Yellen was nominated to become a member of the Federal Reserve Board of Governors, propelling the now-experienced economist towards a future in public finance. From there, Yellen moved into a position at Bill Clinton’s White House, serving as the Chair of the Council of Economic Advisors from 1997 to 1999. Just five years later, she became the President and CEO of the Federal Reserve Bank of San Francisco, assuming responsibility for the central banking of the nine states to the west of the Rocky Mountains. Against the challenging backdrop of the banking crisis, Yellen delivered a strong performance in this position, and was promoted to Vice Chair of the Federal Reserve in 2010, making her the institution’s second highest-ranking official. Yellen’s good judgement and commitment to minimising unemployment earned her many supporters in Capitol Hill. When President Obama confirmed Fed Chair Ben Bernanke would not be re-elected at the end of his term, influential economist Larry Summers initially emerged as frontrunner for the role. However, Summers’ rumoured appointment prompted one third of Democratic Caucus members from the US Senate to pen a letter to President Obama, advising him to instead nominate Yellen. Responding to their wishes, Obama nominated Yellen to lead the Federal Reserve, calling her “one of the nation’s foremost economists and policymakers”. In February 2014, Yellen was sworn in as the Fed’s first female chair in a modest ceremony in the central bank’s boardroom. Upon her historic nomination, Yellen declared: “More needs to be done to strengthen the recovery, particularly for those hardest hit by the Great Recession.” While her predecessor, Bernanke, was praised for helping guide the US economy through the worst of the financial crisis, Yellen inherited a fractious Federal Reserve, still reeling from the 2008 banking crash. Frustrations lingered over the slow pace of economic growth, and critics accused the Fed of doing little to stimulate the economy in the crucial post-crash years. Taking a dovish stance on monetary policy and prioritising employment, Yellen soon sought to silence her doubters, insisting that, on her watch, Wall Street would be closely regulated in order to crack down on financial crime. “No one who lived through that financial crisis would ever want to risk another one”, she remarked in her Capitol Hill confirmation hearing. In fact, Yellen is responsible for helping the economy recover from a crisis that she herself predicted. As early as 2005, Yellen warned of a bubble emerging in housing prices, suggesting the falloff in housing activity could potentially have broader economic consequences. In September 2007, having grown ever more concerned over housing turmoil and irresponsible mortgage lending, Yellen encouraged the central bank to act pre-emptively to deal with what she saw as a looming crisis. “We could take a wait-and-see approach to the financial shock”, she said at a meeting with Federal Reserve policy makers. “But such an approach would be misguided and fraught with hazard, because it would deprive us of the opportunity to act in time to forestall the likely damage.” Despite Yellen’s warnings, however, the central bank failed to effectively isolate the issue, and by September 2008, the subprime mortgage crisis had boiled over into a full-scale financial meltdown. Following Lehman Brothers’ monumental collapse, Yellen became the first central bank official to confirm that the US had entered a recession. In the immediate aftermath of the crash, Yellen lent her support to Bernanke in his efforts to stimulate the economy, backing bond buying and quantitative easing. While recovery has been slow, Yellen appears satisfied with the progress made in the US economy, both prior to and during her current tenure as Fed Chair. Fortunately for Yellen, many of the potential threats associated with Bernanke’s fiscal stimulus efforts have not come to pass: the US economy has avoided hyperinflation and a crashing currency, and Yellen has successfully managed to stabilise markets. “Now it’s fair to say the economy is near maximum employment, and inflation is moving towards our goal”, she said in a January 2017 speech, just two days before President Trump’s inauguration. But despite striking an optimistic tone about the matter, the Trump presidency could well knock Yellen’s Federal Reserve off its steady course. Throughout Trump’s explosive presidential campaign, Yellen became a frequent target for criticism. During the first presidential debate in September, the real estate tycoon attacked Yellen for keeping interest rates low, accusing her of creating a false economy. Taking his criticism further, at one point he suggested that he would remove her from her post as soon as his presidential powers would allow. Aside from the question of Yellen’s leadership, Trump is also on a collision course with the Federal Reserve over the 2010 Dodd-Frank Act. The sweeping legislation, which was put in place by President Obama in response to the 2008 financial crisis, attempts to ensure greater regulation of the nation’s financial institutions, ultimately bringing the ‘too big to fail’ institutions to heel. Trump has repeatedly called Dodd-Frank a “disaster”, and has suggested that the legislation has made it harder for banks to lend to small businesses and consumers. 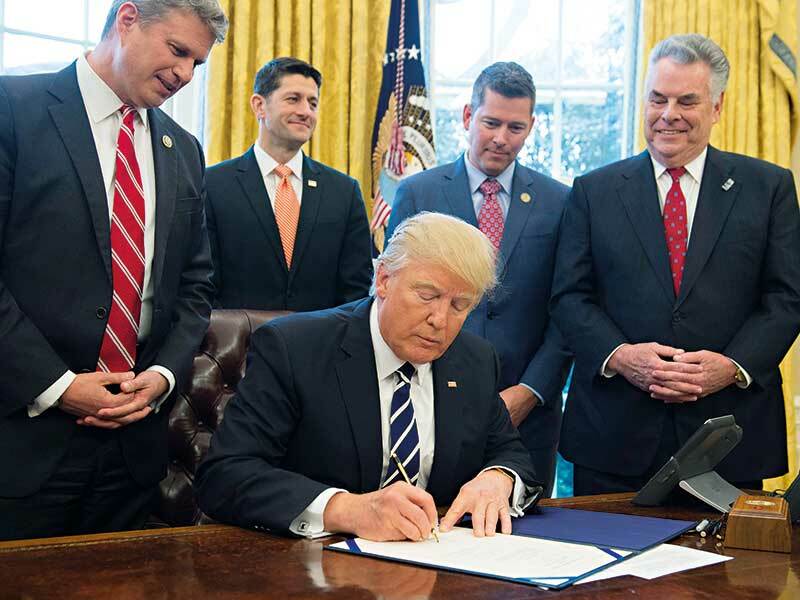 Upon his surprise election, Trump vowed to do a “big number” on the legislation, and has since delivered on his promise: in his second week in the Oval Office, President Trump signed an executive order intended to dramatically scale back the legislation. As he issued the memorandum, he said: “We expect to be cutting a lot out of Dodd-Frank.” According to the executive order, Trump’s Treasury Secretary, Steven Mnuchin, will meet with the Securities and Exchange Commission – along with other regulators – in order to find elements of Dodd-Frank that can be amended or cut entirely. The removal of the Dodd-Frank Act would be a significant blow for the Federal Reserve and, by association, Yellen. The legislation is perhaps the most significant change to US financial regulation since the Great Depression of the 1930s, providing long-overdue protection to consumers and earning praise from both sides of the political spectrum. Despite Trump’s best efforts, it is unlikely Yellen’s Federal Reserve will give up Dodd-Frank without a fight. In fact, since Trump’s election, Yellen has repeatedly promised to protect it. “Dodd-Frank was a very important road map for strengthening the financial system and mitigating the chance of another financial crisis”, she said in January. Stressing the value of the legislation, Yellen said the Dodd-Frank reforms had created a “substantially safer and sounder” financial system, where banking malpractice and financial risk-taking no longer run rampant on Wall Street. While Trump may have met his match in Yellen, it is important to remember that her leadership term expires in 2018. What’s more, two seats on the central bank’s seven-member board of directors are currently vacant, while Vice Chairman Stanley Fischer’s term also comes to an end next year. With Trump thus able to make a host of significant appointments at the Federal Reserve, the central bank may well move in a more hawkish direction. Indeed, the president’s attacks on the institution’s independence and his dismantling of the Dodd-Frank Act suggest this transformation could already be underway. Without Yellen at the helm in the near future, the Federal Reserve could be heading towards an uncertain future. Yellen was born into a middle-class Jewish family in Brooklyn, New York. She showed academic promise from an early age, graduating as valedictorian from Fort Hamilton High School. After earning an undergraduate degree from Brown University, Yellen received a PhD in economics from Yale, where she studied under Nobel Laureate James Tobin. After spending six years as an assistant professor at Harvard, Yellen took up her first position with the Federal Reserve, working as an economist with the Board of Governors in Washington. Following a long teaching spell at two prolific business schools, Yellen moved into a position at the White House, serving as Chair of President Clinton’s Council of Economic Advisors. In June, Yellen began a largely successful six-year term as President of the Federal Reserve Bank of San Francisco, assuming responsibility for the largest district in the US. In a historic moment for global finance, Yellen was sworn in as Chair of the Federal Reserve, becoming the first woman to hold the position in the central bank’s 100-year history.